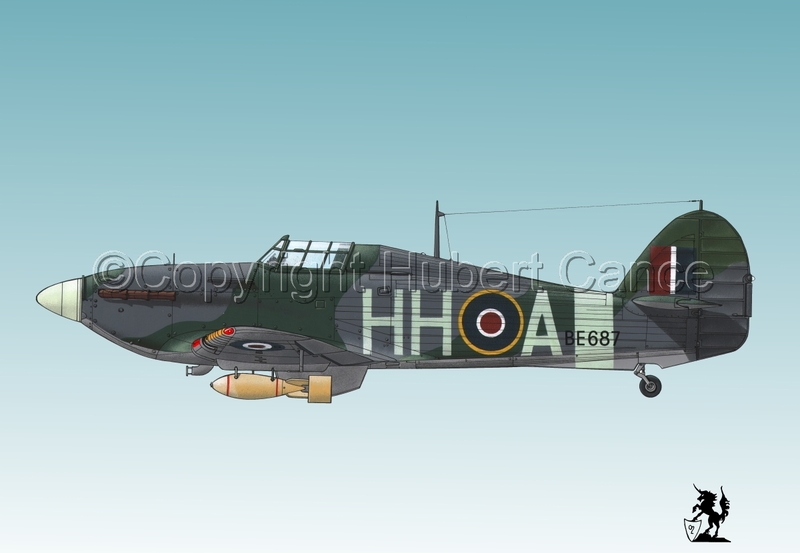 Hawker "Hurricane" Mk.IIb "Hurribomber", HHoA, BE687, Piloted by P/O Derek Leyland Stevenson of the 175th. "Hurribomber" Squadron (N°175 (RAF) Squadron / N°175 (RAF) Bomber Squadron) of the RAF, from RAF Station Warmwell Airfield, during "Operation Jubilee" over Dieppe (France) August 1942. Acrylic and ink on Bristol card. CAD modified to be proposed without badge and with a shadowed background. 5" x 7.25"8" x 11.5"11" x 16"14" x 20.25"17" x 24.5"22.25" x 32"